One of the great barriers to progress in most policy discussions is an “Us” vs. “Them” battle based on historic generalizations and unawareness of change and current practices of the two “sides”. The bad news is there has been much such conflict between “farmers” and “environmentalists”, but there is good news out there. As contentious as discussions of conservation and climate change have been, agricultural practices are being driven by changing weather patterns and budget busting input and commodity prices. The beneficiary is soil and water quality and an increase in carbon sequestration. As a recent article in the New York Times discusses, much of this change is pragmatic, not philosophical or political. With “Almost 1.7 billion tons of topsoil are blown or washed off croplands a year, according to the Department of Agriculture”, American farmers’ innovative practices are addressing a vast problem which creates “billions of dollars in losses for farmers” and untold damage to water quality. 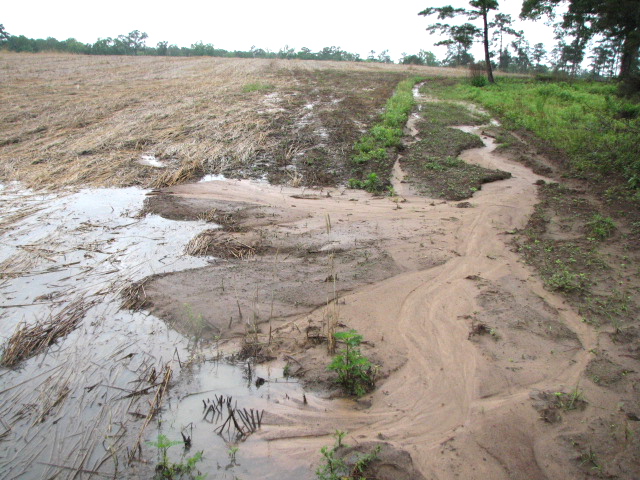 In recent years, row crop farmers across North Florida are increasingly adopting no till planting and returning to cover crop plantings to reduce erosion, increase water infiltration, smother out weeds and keep soils cooler during our blistering summers. Here’s the story of the Florida Soil Health and Cover Crop Group’s first meeting in 2015 and its impact in one field in Jefferson county. It wasn’t raining on April 1st, when the inaugural tour was held. Participants heard descriptions of the value of a winter cover crop,such as cereal rye, in the production of a warm season cash crop. “Discover the Cover” was hosted by Jefferson County UF/IFAS Extension, the Jefferson County Soil and Water Conservation Board, and the Jefferson County office of the USDA Natural Resources Conservation Service in cooperation with the Florida Department of Agriculture and Consumer Services Office of Agricultural Water Policy, Brock Farms. Fulford Family Farms and Fulford 6 Farm. Kirk Brock told of his years of experience of knocking down a cereal rye cover crop and leaving it on the field to reduce erosion, increase soil organic matter, shade out weeds and increase soil water infiltration. “We fertilize the cover crop and use that rye biomass to provide fertility for the summer crop,” Brock said. His soil pits showed attendees how rye roots penetrate the soil profile and leave channels for movement of water and crop roots to follow. “We got tired of moving our topsoil back up the hill every year,” Brock said when he explained his journey from conventional farming to no-till planting on his hilly, dry land acreage. “If I had to go back to conventional planting, I’d get out of farming,” the Jefferson County native has said. After leaving Brock Farms, the group moved to a rye termination demonstration by members of the Fulford families. Visitors watched two different machines flatten the rye in preparation for planting. “It’ll help slow down water movement and keep the soil in the field, “grower Stephen Fulford said as the shiny new roller got its first chance to flatten Florida rye. The roller lays the mature rye down and a herbicide application insures it doesn’t get back up. Stalks aren’t severed; they remain attached to the plant’s mature roots, providing an anchored set of numerous, small obstacles to prevent water flow and soil erosion. On a warm blue sky day, it was a little hard to visualize the effect the rolled rye might have on surface erosion. As usual, things change. I returned to the roller demonstration field on May 1 after lunch. It had just stopped raining, and the fire ant hills didn’t even have dry dirt on top of them yet. One of the wettest Aprils in history, (11.9” at the Monticello Florida Automated Weather Network station) had concluded with 3.1” of rain on the 29th and 30th. An additional 0.98” (4.08” in less than sixty hours) had fallen that morning. Water was running down the field road, through a recently harrowed fire line and into the field. The amazing thing? The sediment went no further than three feet into the rye. The rye mat had stopped the sediment and clear water was moving slowly across the field underneath the rolled rye. The still attached rye stems remained parallel to each other. One of the questions asked at “Discover the Cover” concerned cost effectiveness of such a system. More research needs to be done on actual costs, but one financial fact is as clear as the water at the bottom of these fields. These farmers will be planting as soon as their fields dry out. They won’t be burning any diesel to haul their topsoil back up the hill, and that good Jefferson County soil won’t be lost to the Gulf of Mexico. That’s good news for everybody. More complete information is available on the high biomass cover crop system in the following UF/IFAS publication: Agricultural Management Options for Climate Variability and Change: High-Residue Cover Crops. If you’d like additional information on cover crop and soil health practices, contact Dr. David Wright at wright@ufl.edu or Dr. Danielle Treadwell at ddtreadw@ufl.edu.